I read this article and found it very interesting, thought it might be something for you. 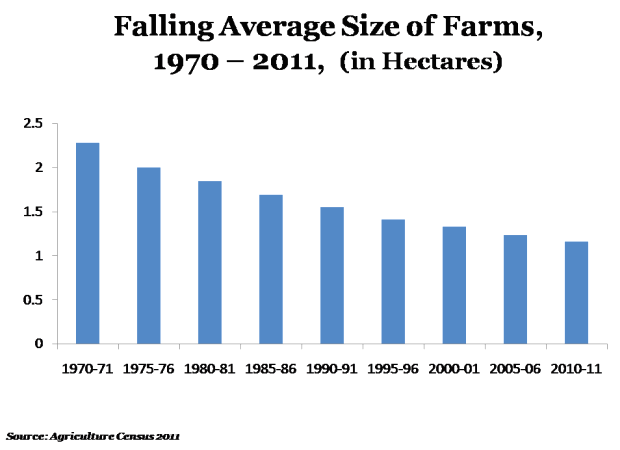 The article is called Farm Sizes Are Shrinking, Amazingly and is located at https://archive.indiaspend.com/sectors/farm-sizes-are-shrinking-amazingly. India’s agriculture sector grew over 3% on an average annual basis in agriculture during the 11th Plan (2007-2012), and the sector accounted for 13.7% (advance estimates) of the GDP at Rs 752,746 crore in 2012-13. 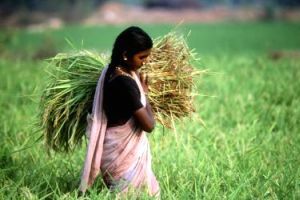 Despite the seeming slow growth numbers, production of rice and wheat hit all-time highs of 105 million tonne and 94.88 million tonne, respectively, in 2011-12, according to the Annual Report of the Department of Agriculture. Now for the bad or unusual news: the growth and record outputs come inspite of the average size of the operational agriculture land holdings steadily declining…. the average operated size has declined from 1.23 hectare in 2005-06 to 1.16 hectare in 2010-11 at the all-India level… the average Chinese farm holdings are even smaller, averaging just 0.6 hectares. One of the main reasons for smaller holdings is the increase in rural population and division of property among family members. According to Agriculture Census 2010-11, operational holding has been defined as all land used wholly or partly for agricultural production and operated as one unit using the same means of production by one person or with others without regards to the title, legal form, size or location…. Small and marginal holdings taken together (below 2 hectare) constitute nearly 85% in 2010-11 as against 83% in 2005-06. There has been a 6% increase in the total number of operational holdings across the country to 138 million from 129 million in 2005-06[AK2] (operationally, yes). And the operated area has increased marginally (0.5%) to 159.18 million hectare from 158.32 million hectare in 2005-06. 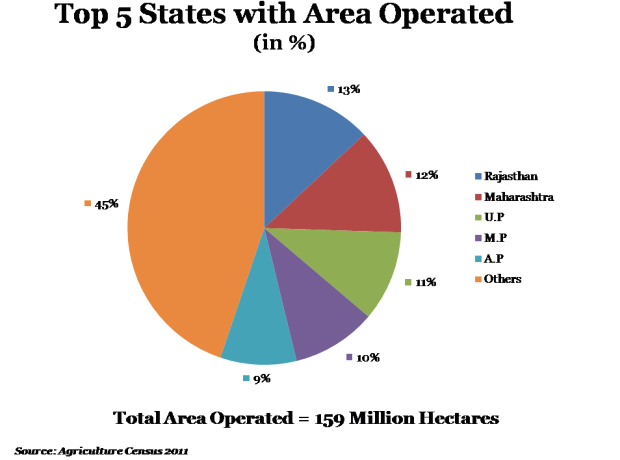 Out of the total 159 million hectare operated in the country, the highest contribution was by Rajasthan (21.14 million hectare) followed by Maharashtra (19.84 million hectare) and Uttar Pradesh (17.09 million hectare.